To define better the molecular basis for follicular dendritic cell (FDC) function, we used PCR-based cDNA subtraction to identify genes specifically expressed in primary FDC isolated from human tonsils. In this work we report the discovery of a novel gene encoding a small secreted protein, which we term FDC-SP (FDC secreted protein). The FDC-SP gene lies on chromosome 4q13 adjacent to clusters of proline-rich salivary peptides and C-X-C chemokines. Human and mouse FDC-SP proteins are structurally unique and contain a conserved N-terminal charged region adjacent to the leader peptide. FDC-SP has a very restricted tissue distribution and is expressed by activated FDCs from tonsils and TNF-α-activated FDC-like cell lines, but not by B cell lines, primary germinal center B cells, or anti-CD40 plus IL-4-activated B cells. Strikingly, FDC-SP is highly expressed in germinal center light zone, a pattern consistent with expression by FDC. In addition, FDC-SP is expressed in leukocyte-infiltrated tonsil crypts and by LPS- or Staphylococcus aureus Cowan strain 1-activated leukocytes, suggesting that FDC-SP can also be produced in response to innate immunity signals. We provide evidence that FDC-SP is posttranslationally modified and secreted and can bind to the surface of B lymphoma cells, but not T lymphoma cells, consistent with a function as a secreted mediator acting upon B cells. Furthermore, we find that binding of FDC-SP to primary human B cells is markedly enhanced upon activation with the T-dependent activation signals such as anti-CD40 plus IL-4. Together our data identify FDC-SP as a unique secreted peptide with a distinctive expression pattern within the immune system and the ability to specifically bind to activated B cells. B lymphocyte development, survival, and activation are critically dependent on interactions with specialized nonhematopoietic cells of mesenchymal origin. In primary lymphoid organs such as bone marrow and fetal liver, developing pre-B lymphocytes undergo their differentiation program in close proximity with cells referred to as stromal cells (1, 2, 3, 4). Stromal cells support survival, proliferation, and differentiation of B cell precursors using both contact-dependent (membrane bound) and soluble growth factors, several of which have been identified and well characterized. In secondary lymphoid organs, mature B lymphocytes interact with cells known as follicular stromal cells or follicular dendritic cells (FDCs),3 which are present in primary and secondary follicles (5, 6, 7, 8, 9). One defining characteristic of FDCs is their ability to trap immune complexes and act as Ag depots during the germinal center (GC) response (10, 11, 12, 13). While immune complex deposition on FDCs may not be essential for initiation of GC responses (14), FDCs play a central role in organization of the follicular structure that supports B cell survival, affinity maturation of Ab responses, and the generation of long-lived B cell memory (7, 14, 15, 16, 17, 18, 19). Primary human or mouse FDCs (20, 21, 22, 23) and human FDC cell lines (24, 25, 26, 27) can directly stimulate B lymphocyte survival and proliferation, Ig secretion, and expression of costimulatory molecules in vitro. However, the molecular basis for FDC-B cell interactions remains poorly characterized. Several mAbs have been generated that differentially stain FDCs in tissue sections (28, 29, 30, 31). Most of the markers recognized by these mAbs are unknown, but they have been useful for FDC identification and study of FDC development. Expression cloning studies led to identification of markers recognized by two such mAbs as a novel splicing isoform of the complement receptor CD21 (32) and a novel transmembrane protein that appears to be involved in FDC-B lymphocyte interactions (33, 34). FDC also produce the chemokine B lymphocyte chemoattractant (BLC; also known as CXCL13) (35), which is the most efficacious chemoattractant for B lymphocytes known and is indispensable for organizing the follicular structure in lymphoid organs (36, 37). Induction of mature, BLC-producing FDC networks requires interactions between FDC precursors and B cells expressing the TNFR family ligands lymphotoxin α1β2 and TNF (38, 39, 40) and, reciprocally, BLC can induce expression of membrane lymphotoxin α1β2 on B cells (36). Thus, bidirectional signaling mechanisms between FDCs and B cells are critical for establishment of a functional follicular structure. Furthermore, FDC-B cell interactions may play a critical role in organizing the follicle-like structures observed in multiple nonlymphoid tissues during chronic immune reactions (41, 42, 43, 44, 45, 46, 47). To define better the molecular basis for FDC-B cell interactions, we devised a strategy to isolate genes specifically expressed in primary human FDCs. In this work we report the identification of a set of FDC-associated genes cloned by this approach and the initial characterization of FDC-SP, a gene encoding a novel secreted protein. Highly enriched FDC populations were obtained from human tonsils according to the method of Liu et al. (32). Briefly, tonsils were minced in RPMI 1640 medium containing FCS and collagenase IV (Sigma-Aldrich, St. Louis, MO) and the released cells were harvested. The low buoyant density fraction was obtained using a Percoll gradient (40/45% interface), then cells were stained for CD21 and CD14 expression and the FDC population was isolated by FACS using the indicated gate (Fig. 1⇓). Recoveries of CD14+CD21+ cells from the low-density population varied between 0.5 and 2%. Total RNA was isolated and pooled RNA from three sorted preparations (1 × 106 cell equivalents) was used to generate double-stranded cDNA by the SMART (switching mechanism at RNA termini) PCR cDNA synthesis method (Clontech Laboratories, Palo Alto, CA). 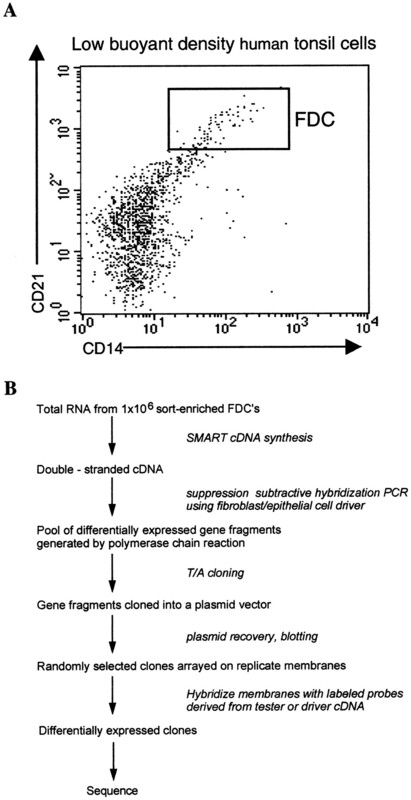 A double-stranded driver cDNA was concomitantly produced by the same method using an equal mixture of RNA from the human fibroblast cell line HFF and the epithelial line HeLa (Fig. 1⇓). A suppression subtractive hybridization (SSH) PCR subtraction procedure was conducted according to the manufacturer’s protocol (PCR Select; Clontech Laboratories), using the FDC cDNA as tester and the fibroblast/epithelial cell cDNA as driver. The pool of differentially expressed gene fragments generated were then cloned into the pCRII vector (Invitrogen, Carlsbad, CA) and 60 clones were randomly picked and screened for differential expression using tester and driver cDNA probes. Approximately 70% of the clones appeared to be differentially expressed as assessed by hybridization with tester and driver cDNA probes (data not shown). Twenty-nine differentially expressed clones were sequenced by dye-terminator sequencing. Sequences are summarized in Table I⇓. Strategy for isolation of FDC-associated genes. A, Low buoyant density tonsil cells were isolated and stained for CD21 and CD14 expression. The gate used for isolation of FDC by cell sorting is shown. Single-color controls confirmed that the CD14 staining is not due to bleedthrough between channels, but represents specific staining of a population with very high forward scatter. B, Flow chart showing the gene cloning strategy. A 32P-labeled FDC-SP cDNA probe was hybridized to human multiple tissue Northern blots (Clontech Laboratories) and to a Northern blot containing 2 μg of poly(A)+ RNA isolated from human tonsils, according to the manufacturer’s protocol. For RT-PCR analysis of FDC-SP expression, 0.5–1 × 106 cell equivalents of total RNA from the indicated cells was reverse transcribed using avian myeloblastosis virus reverse transcriptase and random hexamer primers (Promega, Madison, WI). One-tenth of the resulting cDNAs were subjected to PCR amplification for 30 cycles using FDC-SP-specific primers CAGCGTCAGAGAGAAAGAACTGACTG and TACTTTTCGCTAGGAAGGGGAGTTG or G3PDH control primers TGAAGGTCGGAGTCAACGGATTTGGT and CATGTGGGCCATGAGGTCCACCAC. The resulting PCR products were run on agarose gels and either stained with ethidium bromide or Southern blotted and hybridized with appropriate oligonucleotide probes. In situ hybridization was conducted essentially as described (48). Briefly, tonsil sections were deparaffinized, treated with proteinase K (Sigma-Aldrich), washed, prehybridized, and then hybridized overnight at 50°C with hybridization solution containing 106 cpm of 35S-labeled probe. Sense and antisense probes were generated by in vitro transcription of plasmid templates containing the FDC-SP cDNA in forward and reverse orientations in the presence of [35S]UTP. After hybridization, slides were rinsed, digested with RNase A (type XI; Sigma-Aldrich), and washed twice with 2× SSC at room temperature and twice with 0.1× SSC at 50°C for 40 min each. After washing, slides were dehydrated with successive ethanol rinses, air dried, dipped in emulsion (Kodak NTB2 diluted 1/1 in water), exposed for 3–10 days at 4°C, and then developed. Every second slide in the series was counterstained with H&E to confirm GC structure. For analysis of FDS-SP expression and binding in primary human leukocytes, mononuclear cells were prepared from human blood as described (49) and cultured for 1–3 days at 1 × 106 per milliliter in RPMI/10% FCS medium. The following concentrations of stimuli were used: 100 ng/ml LPS (Sigma-Aldrich), a 1/25,000 dilution of Staphylococcus aureus Cowan strain 1 (SAC; Calbiochem, La Jolla, CA), 10 ng/ml TNF-α (PeproTech, Rocky Hill, NJ), or 1 μg/ml anti-CD40 (BD PharMingen, San Diego, CA) plus 2 ng/ml IL-4 (PeproTech). Cells were harvested at the indicated times and counted, and RNA was prepared using TRIzol (Life Technologies, Rockville, MD). For some experiments, after 3 days of stimulation PBMC were then cocultured overnight with L cell transfectants as described below. FDC-1 or HK cells were cultured as described (25, 26) with or without the addition of LPS or TNF-α. FDC-SP cDNA was cloned into pcDNA3.1 myc/his (Invitrogen) in frame with the myc epitope tag. The RR→GG mutation was introduced by primer-directed mutagenesis. All constructs were confirmed by sequencing before use. COS cell culture and transfection by the DEAE-dextran method were performed as described (50). The day after transfection, medium was replaced with fresh medium containing 1% FCS. Cells and supernatants were then collected at day 4 after transfection for immunoprecipitation analysis. BJAB cells were cultured and transfected by electroporation as described (51). The day after transfection cells were centrifuged and replated at high density (106 cells/ml) in medium containing 1% FCS. Cells and supernatants were then collected at day 4 after transfection. Cell lysate preparation, immunoprecipitation, and Western blotting were conducted as described (52). L cells were transfected with wild-type or mutant FDC-SP-myc vector using Lipofectamine (Invitrogen) and stable clones were generated by G418 selection. The indicated cell lines or primary cells were added to semiconfluent L cell cultures, cocultured overnight, and harvested. Cells were then stained for detection of myc-tagged protein on the cell surface using FITC-labeled anti-myc Ab (Invitrogen) or FITC-labeled Mopc21 isotype control Ab (BD PharMingen) and analyzed on a FACSCalibur instrument (BD Biosciences, Mountain View, CA). In some experiments, cells were also stained with biotinylated anti-CD19 (BD PharMingen) followed by streptavidin-PE (Jackson ImmunoResearch Laboratories, West Grove, PA). To identify genes specifically expressed by human FDC, we first generated FDC-enriched cell preparations from human tonsils using the cell sorting method described by Liu et al. (21). This method identifies FDC by coexpression of the markers CD21 (complement receptor 2) and CD14 (Fig. 1⇑). Total RNA isolated from enriched FDCs were pooled from three separations and used to prepare double-stranded cDNA. PCR analysis of the resulting cDNA using primers that distinguish FDC and B cell isoforms of CD21 (32) indicated that both isoforms were present in approximately equal proportions (data not shown), suggesting that our cell preparations contained adhering GC B cells in addition to FDCs. For our cDNA subtraction strategy we chose to perform two subtractions: one using sort-purified B cells isolated from the same donors as the source of the driver cDNA (because B cells were likely the major contaminant of our FDC preparations) and the other using a mix of cDNA from human fibroblast and epithelial cell lines (because FDC are generally thought to be nonhematopoietic cells of mesenchymal origin). Surprisingly, the former subtraction failed to give a robust SSH PCR and the clones that were isolated were largely widely expressed housekeeping genes (data not shown), while the latter subtraction resulted in a robust SSH PCR and a high frequency of differentially expressed genes (see Table I⇑). We speculate that the B cell-specific genes present in the FDC preparations may have provide a “carrier” effect during the subtraction procedure by increasing the number of genes differentially expressed between the tester and driver. The majority of sequences corresponded to “named” genes present in the GenBank database and these included several B lymphocyte genes known to be up-regulated upon activation, such as Ig L chains, MHC class II, CD69, and RGS1/BL34 (Table I⇑). Several novel genes were present among this initial set of sequences, one of which encodes Bam32, a novel CD40-inducible B lymphocyte signal transduction molecule that we have described elsewhere (51), and another which encodes a novel C-type lectin, DCAL-1 (64). One of the novel sequences contained a short open reading frame that encodes a small protein containing the hallmarks of a signal peptide at its N terminus (Fig. 2⇓A). Based on the evidence described below, we have named this gene product FDC-SP (FDC secreted protein). Inspection of the predicted amino acid sequence of FDC-SP shows a highly charged N-terminal sequence adjacent to the putative leader peptide and a moderately proline-rich central region (Fig. 2⇓A). FDC-SP appears to be structurally unique and has no significant similarity to known genes in GenBank. More than 30 sequences matching our FDC-SP sequence are present in the human expressed sequence tag (EST) database, and these derive largely from fetal tissue or tumor cell libraries. Notably, none of the EST clones were derived from B cell cDNA libraries, in contrast to Bam32, for which nearly one-third of the EST clones are derived from normal or GC B cell libraries. FDC-SP sequence and chromosomal location. A, Sequence alignment of human and mouse FDC-SP proteins. The putative secretion signal is underlined. 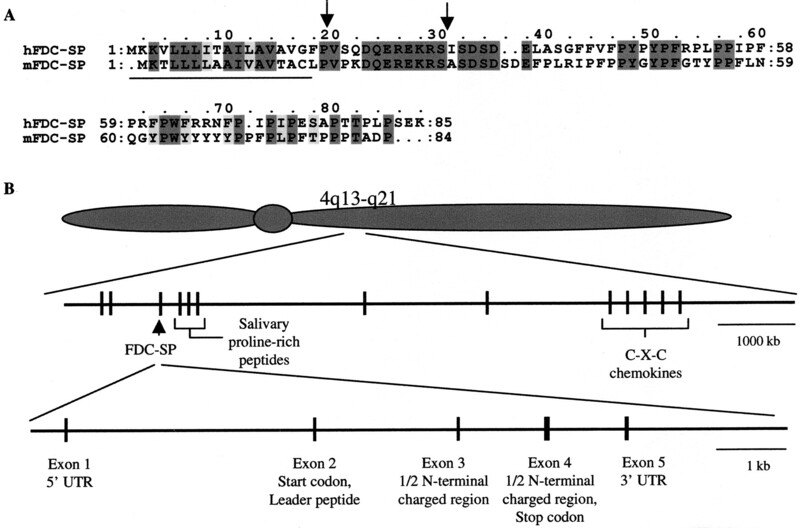 Locations of conserved intron/exon borders are indicated by arrows. Note the proline-rich sequence of the central peptide and the conserved N-terminal charged sequence. FDC-SP sequences can be accessed in GenBank (human, accession no. AF435080; mouse, accession no. BF300338). B, Chromosomal location of human FDC-SP. The relative location of FDC-SP exons on chromosome 4 are indicated, based on basic local alignment search tool (BLAST) comparison of the cDNA sequence with the public draft human genome sequence (http://www.ncbi.nlm.nih.gov/genome/seq/). Approximate scale, as determined from the public genome sequence, is indicated on the left. Note that a similar five-exon structure was noted for mouse FDC-SP (data not shown). Searches of the public human genome sequence revealed that FDC-SP is a single-copy gene that maps to chromosome 4q13 (Fig. 2⇑B). Interestingly, FDC-SP is closely linked with genes encoding three proline-rich salivary/tear gland proteins as well with as the cluster of C-X-C chemokines, which includes the B lymphocyte chemoattractant BLC. The FDC-SP gene is spread over ∼10 kb and contains five exons which encode the 5′ untranslated region (exon 1), the leader peptide (exon 2), most of the N-terminal charged region (exon 3), the remainder of the coding sequence (exon 4), and the 3′ untranslated sequence (exon 5). Three murine ESTs with significant homology to FDC-SP were recently deposited into the database. We have confirmed the sequence of two of these clones and they encode a putative murine homolog of FDC-SP (Fig. 2⇑A). Murine FDC-SP shows 45% amino acid identity and 54% amino acid similarity with human FDC-SP, with the highest degree of conservation (>80% identity) evident in the charged N-terminal sequence. The proline-rich region is conserved in terms of proline content (21.4% proline overall vs 18.8% for human); however, the primary amino acid sequence of this region is only modestly conserved. The sequence of an unmapped murine genomic clone containing murine FDC-SP was recently deposited in GenBank and sequence alignments show that the intron/exon structure is virtually identical to the human gene, further supporting a close evolutionary relationship (data not shown). The expression of FDC-SP was examined by hybridization of the FDC-SP cDNA with Northern blots containing mRNA from a large variety of human tissues (Fig. 3⇓A). FDC-SP mRNA was detected as a single 0.5-kb band and was abundantly expressed in tonsils (a mucosa-associated lymphoid tissue), lymph nodes, and trachea. Interestingly, FDC-SP expression in other lymphoid tissues such as spleen, peripheral blood leukocytes, and bone marrow is much lower or absent. FDC-SP is also significantly expressed in prostate, and at much lower levels in colon, stomach, and thyroid, but not in >10 other tissue types, including heart, brain, lung, liver, or skeletal muscle. Thus, FDC-SP appears to have a restricted tissue distribution. Expression of FDC-SP in human tissues and cell lines. A, Northern blots containing 2 μg of poly(A)+ RNA from the indicated tissue source were hybridized with a 32P-labeled FDC-SP cDNA probe, then stripped and reprobed with a β-actin cDNA probe. B, RNA from the indicated cell lines were examined for FDC-SP expression using RT-PCR followed by Southern blot analysis. cDNA from the FDC-enriched fraction of human tonsil was used as a positive control for FDC-SP expression. Note that all of the cell lines examined, including B and T lymphocytes, fibroblasts, and epithelial cells, are negative for FDC-SP expression, but all express the housekeeping gene G3PDH. 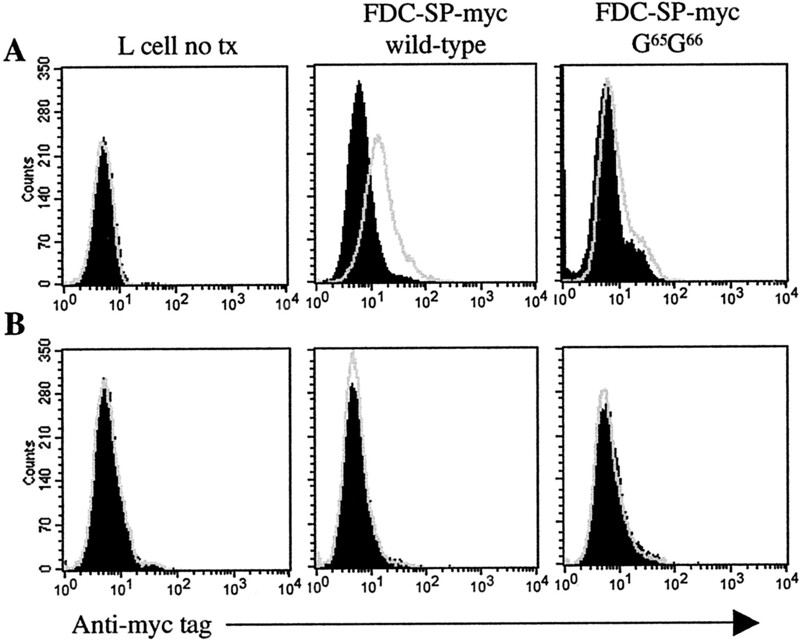 To determine which cell types within the secondary lymphoid tissues may be expressing FDC-SP, we examined FDC-SP expression in a panel of cell lines comprising B lymphocytes, T lymphocytes, myeloid cells, and epithelial cells, as well as FDCs isolated from tonsils as a positive control (Fig. 3⇑B). Our results showed strong expression of FDC-SP in tonsillar FDCs but no expression in any of the cell lines examined. In addition, FDC-SP expression was not detected in myeloid-lineage dendritic cells (data not shown), which are fundamentally distinct from FDCs in their lineage derivation, phenotype, and function (53, 54, 55). These data support the hypothesis that FDC-SP expression in lymphoid tissues is primarily due to expression in FDCs. To further characterize the expression of FDC-SP within lymphoid tissues, we analyzed FDC-SP expression in human tonsils by in situ hybridization (Fig. 4⇓, A and B). An antisense RNA probe gave a very robust signal on tonsil sections, while a sense RNA probe gave no significant signal (data not shown). Strong signals were observed in all GCs, while no significant expression was observed in the intervening T cell areas. The intensity of expression is clearly higher in the central “light zone,” which is known to contain the highest density of FDCs, than in the “dark zone,” which contains closely packed B lymphocyte blasts, suggesting that FDC-SP is expressed in FDC but not GC B cells. Consistent with this interpretation, sort-purified GC B cells are virtually devoid of FDC-SP expression, while unsorted tonsillar cells from the same patient express high levels of FDC-SP (Fig. 4⇓C). The follicular mantle, which contains primarily naive B lymphocytes not participating in the response and a few FDC cytoplasmic processes, showed a much lower intensity of FDC-SP expression. Indeed, sort-purified naive B cells we also found to express little or no FDC-SP (Fig. 4⇓C). To confirm expression by FDC, we also assayed FDC-SP expression in two independently derived tonsillar FDC-like cell lines, namely FDC-1 (25) and HK (26). It was found that these lines expressed detectable levels of FDC-SP but can be induced to high-level expression after brief exposure to TNF-α (Fig. 4⇓D). This TNF-activated expression of FDC-SP appears to be specific to FDC, because TNF-treated B cells (Fig. 4⇓D) or fibroblasts (data not shown) did not express detectable levels of FDC-SP. Collectively these data strongly support the conclusion that FDC-SP is expressed by FDCs, rather than B cells, within active GCs. FDC-SP is highly expressed in tonsillar GCs but not in GC B cells. Expression of FDC-SP in human tonsil sections was examined by in situ hybridization with a 35S-labeled antisense RNA probe. No significant signal was observed with a sense RNA probe (data not shown). A, Low-magnification view of section with no counterstaining, showing expression of FDC-SP in GCs. 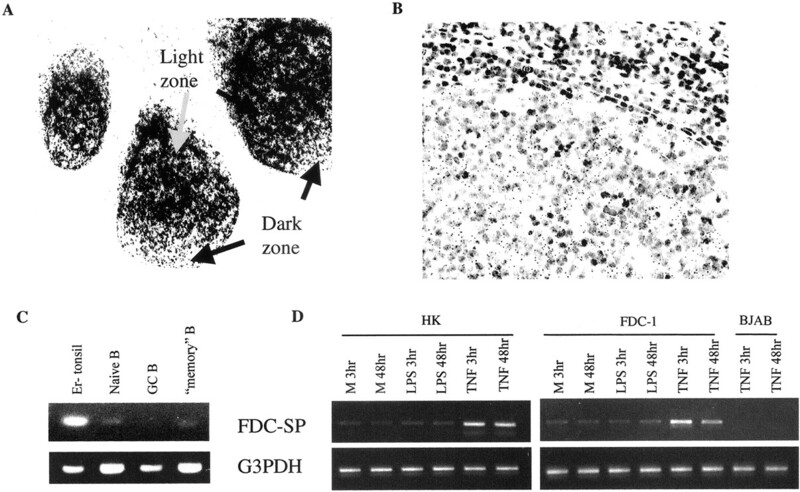 Note the preponderance of FDC-SP signal in the central area of the GCs corresponding to the light zone and reduced expression in areas corresponding to the dark zone (confirmed by counterstaining of serial sections). B, High-magnification view of counterstained GC, showing rapid decrease in signal at the border of the light zone. C, GC B cells do not express FDC-SP. Tonsil cell suspensions were depleted of T cells by rosetting (Er− population), stained for CD38 and IgD expression, and sorted into naive (IgD+CD38−), GC (IgD−CD38+), and memory cell (IgD−CD38−) populations, and FDC-SP expression was determined by RT-PCR. Note that all of the sorted B cell populations are greatly depleted of FDC-SP expression compared with the unsorted population, which contains FDCs. D, Two FDC-like cell lines express high levels of FDC-SP after stimulation with TNF-α. Cells were cultured with medium (M) or for the indicated time with LPS or TNF-α, then expression of FDC-SP was determined by RT-PCR. Note that BJAB cells fail to express FDC-SP after TNF-α treatment. In addition to GCs, FDC-SP was also highly expressed in inflamed tonsillar crypts (Fig. 5⇓, A and B). These are deep invaginations of the epithelia, which open into the oral cavity and are often the site of inflammatory responses in tonsillitis. Crypt epithelia also contain secretory ducts and may be important sites of Ab secretion into the oral cavity. FDC-SP expression was not observed in the organized epithelial layer of the exterior capsule (data not shown), suggesting that expression is restricted to the leukocyte-infiltrated epithelial areas. The signal is clearly present through several cell layers, suggesting that it is not derived from activated epithelial cells but may derive from either locally activated stromal cells and/or infiltrating leukocytes. FDC-SP is expressed at sites of leukocyte infiltration within the tonsillar epithelium and expression can be induced in human leukocytes by innate immunity signals but not T-dependent B cell activation signals. 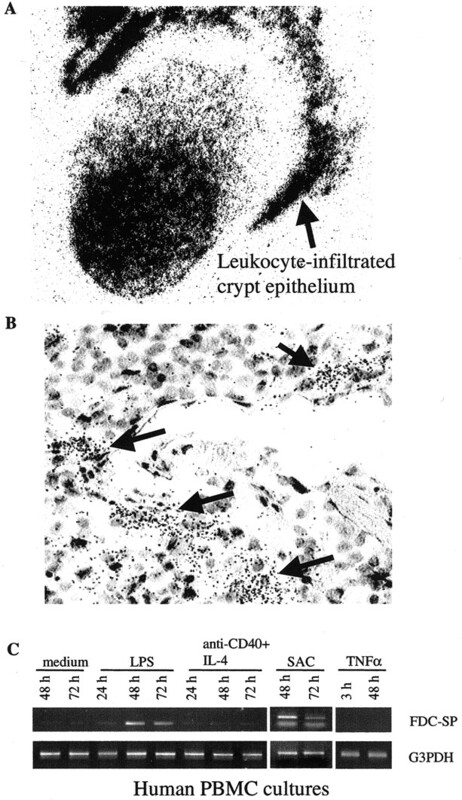 A, FDC-SP is also expressed in leukocyte-infiltrated tonsillar crypts. Low-magnification view showing a crypt with intense FDC-SP expression adjacent to a GC. B, High-magnification view of a counterstained tonsillar crypt, showing irregular areas of FDC-SP expression within the infiltrated areas. C, Human PBMC can be induced to express FDC-SP in the presence of LPS or SAC, but not CD40 plus IL-4. Freshly prepared PBMC were cultured for the indicated time in medium alone or in the presence of LPS, SAC, or anti-CD40 plus IL-4. Expression was determined by extracting RNA, performing RT-PCR, and separating the resulting PCR products on ethidium bromide-stained gels. Data are representative of six RT-PCR experiments and three independent cell isolations. To test whether activated human leukocytes can express FDC-SP, we isolated PBMC from human subjects, cultured them for 24–72 h alone or with LPS or SAC, and assessed FDC-SP expression by RT-PCR. These stimuli were used at concentrations shown to potently induce expression of type I cytokines and chemokines such as IL-12, IL-18, IFN-γ-inducible protein-10, and monokine induced by IFN-γ (data not shown). We found that the PBMC cells do not express significant levels of FDC-SP directly ex vivo, or when cultured without addition of stimulating agents, consistent with our Northern blot analysis (Fig. 3⇑A, lane 8). However, FDC-SP expression is clearly induced within 48 h after culture with LPS or SAC (Fig. 5⇑C). In contrast, stimulation of PBMC with a T-dependent B cell activation signal, anti-CD40 plus IL-4, did not induce expression of FDC-SP (Fig. 5⇑C). This result indicates that FDC-SP expression in leukocytes can be up-regulated by innate immunity signals but not T-dependent activation signals. Interestingly, the PBMC cells also did not express FDC-SP in response to TNF, indicating that the TNF-regulated expression of FDC-SP may be a unique property of FDCs. To study FDC-SP protein biosynthesis and function, we prepared expression constructs encoding FDC-SP fused to a myc epitope tag and transfected these constructs into COS cells. Cell lysates and supernatants of the transfected cells were harvested and the myc-tagged FDC-SP proteins were immunoprecipitated and detected by Western blot analysis (Fig. 6⇓). As a control, cells were transfected with expression constructs encoding Bam32-myc (51) or untagged FDC-SP. In the cell lysates, FDC-SP-myc was observed as a band running at 14–15 kDa on SDS-PAGE. This is slightly larger than the predicted molecular mass of FDC-SP-myc (13.1 kDa including the putative secretion signal). In the supernatants, FDC-SP-myc was observed as a broad band running at ∼19–22 kDa. 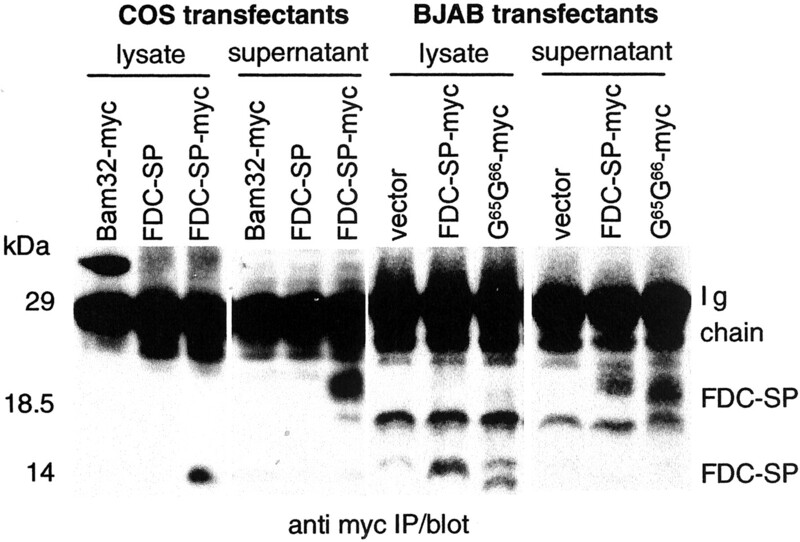 Bam32-myc transfectants show the expected 35-kDa band in the lysates, but no band in the supernatants, confirming that there is minimal nonspecific release of cytoplasmic proteins into the supernatants. 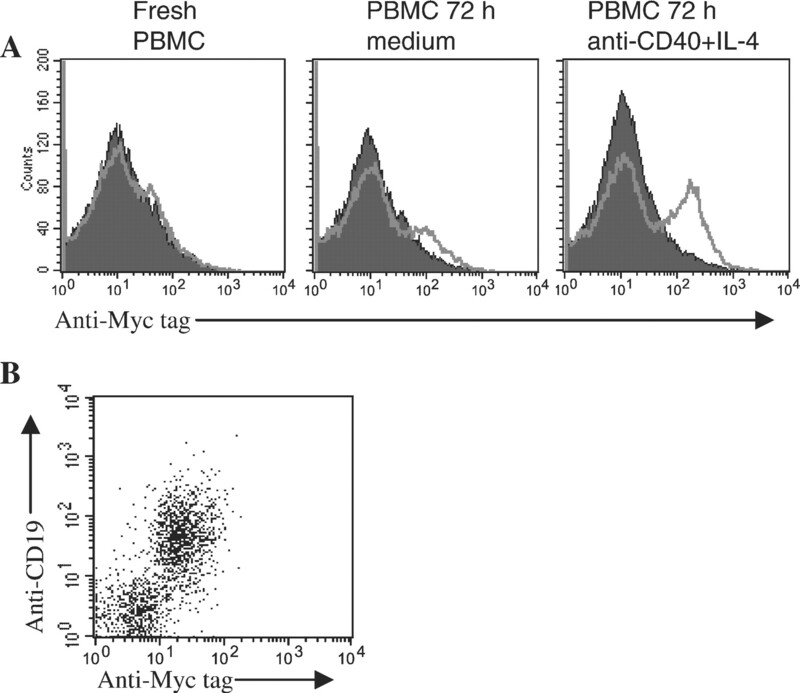 Similar results were observed when FDC-SP-myc was expressed in the human B lymphocyte line BJAB (Fig. 6⇓). These results demonstrate that FDC-SP is a secreted protein and suggest that FDC-SP undergoes heterogenous posttranslational modification during biosynthesis and trafficking through the secretory pathway. FDC-SP is a secreted protein. Left panel, COS-1 cells were transfected by the DEAE-dextran method using pcDNA3 vectors encoding native or myc-tagged human FDC-SP, or myc-tagged Bam32 as an intracellular protein control. Cells and culture supernatants were harvested 6 days after transfection. Expression of tagged proteins was analyzed by immunoprecipitation and Western blotting with 9E10 anti-myc Ab. Intracellular FDC-SP-myc protein runs as a 14- to 15-kDa protein, while secreted FDC-SP-myc runs as a 19- to 22-kDa protein (indicated by arrows). The predominant band running at 28 kDa represents the L chain of the immunoprecipitating Ab. The 17-kDa background band present in the BJAB blots does not appear to be related to FDC-SP because it is present in the empty vector transfectants. Results are representative of four experiments. Right panel, BJAB B lymphoma cells were transfected by electroporation using native or myc-tagged human FDC-SP, harvested 3 days after transfection, and analyzed as in the left panel. Results are representative of three experiments. We hypothesized that the pairs of basic residues flanking the proline-rich sequence might be important for the function of FDC-SP, because such dibasic motifs can be the target sites for cleavage by proteases, such as has been well characterized for peptide hormone precursors (56). Therefore, we generated constructs encoding mutant FDC-SP-myc in which either the N-terminal lysine-arginine (K28R29) or the C-terminal arginine-arginine (R65R66) were converted to glycines. Interestingly, we reproducibly failed to detect protein expression of the K28R29→G28G29 mutant, despite correct sequence insertion and mRNA expression (data not shown), suggesting that this mutation within the N-terminal charged region renders the protein unstable or insoluble. However, the R65R66→G65G66 FDC-SP-myc was expressed well in BJAB cells and resulted in both intracellular and secreted protein (Fig. 6⇑). The molecular mass of the protein was substantially altered, suggesting that this mutation may affect the posttranslational processing of FDC-SP. We hypothesized that FDC-SP may function by binding to and influencing the behavior of immune cells. Because FDC-SP mRNA is present within GCs where B lymphocytes are undergoing proliferation, differentiation, and affinity selection (8, 57, 58), we assessed whether B cells might represent one such cellular target of FDC-SP. We established a FACS-based assay for FDC-SP binding using stably transfected fibroblast cells as a source of epitope-tagged FDC-SP and assayed binding of FDC-SP to B cells (BJAB) or T cells (Jurkat). We found that FDC-SP showed significant binding to B cells, but not T cells, and this binding was blocked by the G65G66 mutation (Fig. 7⇓). We then used this same assay to examine whether FDC-SP can bind to primary human leukocytes. We found that fresh PBMC cells show very little FDC-SP binding (Fig. 8⇓). However, we reasoned that if GC B cells represent a specific target of FDC-SP it is possible that resting peripheral B cells may only acquire the ability to bind FDC-SP after undergoing T-dependent activation. Therefore, we examined the ability of cells stimulated with anti-CD40 Ab and IL-4 to bind FDC-SP (Fig. 8⇓A). It was found that CD40 plus IL-4-activated PBMC cultures reproducibly developed a large FDC-SP binding population. To determine whether this population represents B cells, we performed two-color analysis and found that virtually all of the FDC-SP-binding cells coexpress the B cell marker CD19 (Fig. 8⇓B), suggesting that activated B cells represent a specific target for FDC-SP. FDC-SP binds to the surface of B lymphoma cells but not T lymphoma cells. B or T lymphoma cells were cocultured with mouse fibroblasts (L cells) stably transfected with myc-tagged human FDC-SP proteins. Nonadherent cells were harvested after 18 h of coculture and analyzed for myc-tagged protein at the cell surface by staining with FITC-labeled anti-myc mAb. Gray open traces indicate anti-myc staining and filled traces represent staining with the isotype control mAb. Residual L cells were excluded from the analysis by side scatter gating. A, BJAB cells. B, Jurkat cells. Note that BJAB cells, but not Jurkat cells, show binding to FDC-SP and the G64G65 mutant FDC-SP showed no significant binding to either cells. 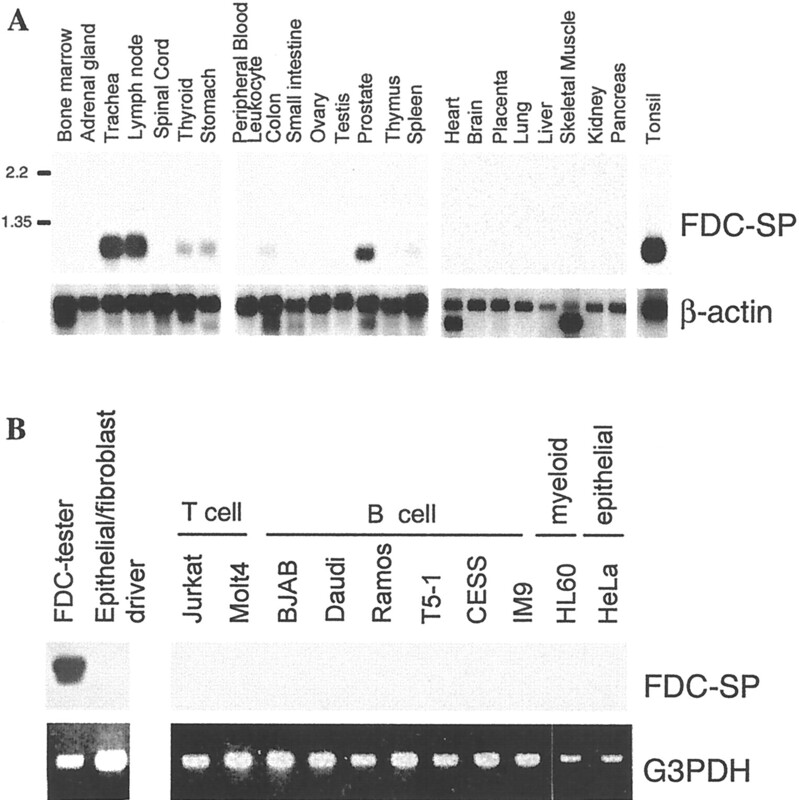 FDC-SP binding to peripheral blood B cells is enhanced by T-dependent activation signals. PBMC were cultured for 3 days in medium or with anti-CD40 plus IL-4 and then cocultured with FDC-SP-myc L cell transfectants for 18 h before analysis. A, Cells were stained with FITC-anti-myc or isotype control and analyzed by flow cytometry. Results are representative of three experiments. B, After 3 days of culture with anti-CD40 plus IL-4, PBMC cells were cocultured with FDC-SP-myc transfectants for 18 h and then stained with FITC-anti-myc and PE-anti-CD19. Together, our findings on FDC-SP expression, biosynthesis, and cell binding activity lead us to hypothesize that this molecule is a novel secreted mediator that regulates immune responses. While the immunoregulatory function(s) of FDC-SP remain to be determined, its exquisite pattern of expression, its regulation by TNF-α, and its specific binding to activated B cells suggest that one important function may be to regulate B cell responses in GCs. Because FDC-SP expression in spleen is <5% that in tonsil or lymph nodes and spleen tissue contains many primary follicles, we favor the hypothesis that FDC-SP expression is low or absent in primary follicles but is up-regulated in the follicles during GC formation. It is known that FDC networks expand and display phenotypic changes during the GC response (59, 60, 61). We propose that FDC-SP is one of the genes that is turned on during FDC activation. FDC-SP is unique in this regard, because only a handful of genes, and even fewer encoding secreted proteins, are known to be selectively expressed by activated FDCs. Together with the unique structure of the FDC-SP protein, it is tempting to speculate that FDC-SP has a novel, nonredundant function in regulating B cell responses. Our results indicate that FDC-SP is specifically and strongly expressed within GCs, in a pattern that is consistent with expression by FDCs. Several other lines of evidence support this interpretation, including data showing FDC-SP is not expressed by a variety of B cell lines examined or by primary human B cells, CD40 plus IL-4-activated B cells, or sort-purified GC B cells. In contrast, we find that FDC-SP is expressed by sort-enriched FDCs and two independently derived FDC-like cell lines. It will be important to determine the molecular signals controlling FDC-SP expression within GCs. In this regard it is interesting that high-level expression of FDC-SP by FDC-like cells requires a brief exposure to TNF-α. This result is consistent with previous work showing that TNF-α stimulation of FDC-like cells can up-regulate expression of chemokines, including some of the chemokines genetically linked to FDC-SP on chromosome 4 (62) and adhesion molecules such as ICAM-1 (24). Because TNF expression on B cells has been shown to provides critical signals for the generation and maintenance of mature, functional FDC networks (36, 38, 40), it is tempting to speculate that FDC-SP may represent one of the TNF target genes involved in this bidirectional signaling process. Up-regulation of FDC-SP expression by cytokines such as TNF may also explain why FDC-SP is expressed at much higher levels in lymph nodes and tonsils than in spleen and peripheral blood, in that the former tissues might be expected to be generally more “active” in immunological terms than the latter. Interestingly, FDC-SP expression is also up-regulated during the inflammatory process occurring in tonsil crypts. Because FDC may derive from cells of mesenchymal origin that are induced to take on the FDC phenotype by activated B lymphocytes (7, 38, 41), one possibility is that stromal cells present under the crypt epithelium are induced to express FDC-SP during the inflammatory response, perhaps in response to local production of TNF or other cytokines. Our finding that circulating leukocytes can be induced to express FDC-SP in the presence of microbial products suggests that the expression in tonsillar crypts may also be at least partially derived from infiltrating leukocytes. We speculate that FDC-SP is produced in response to the local infection within the crypts and may play a role in controlling the infection, perhaps by regulating local mucosal B cell responses. In this context it is interesting to note that memory B cells may specifically home to submucosal areas of the tonsil (63). Our working hypothesis is that FDC-SP functions in intercellular communication by binding target cells through a specific signaling receptor, analogous to cytokines/chemokines. While FDC-SP does not share significant primary sequence homology with cytokines or chemokines, the overall amino acid composition, molecular mass, and charge (pI) of FDC-SP is similar to known inflammatory mediators such as IL-8. Furthermore, FDC-SP is linked to the cluster of α-chemokines on chromosome 4q13 that includes IL-8 and other proinflammatory chemokines. Our data indicate that FDC-SP can bind B cells, but not T cells or any other cell types present in the circulation, suggesting that B cells may be the primary target of FDC-SP. The finding that FDC-SP binding activity is up-regulated upon B cell activation with anti-CD40 plus IL-4 suggests that B cells activated during a T-dependent response may represent the more specific target of FDC-SP. This result fits with a model where FDC-SP regulates GC initiation and maintenance by acting upon newly activated B cells transiting from the T zones. To our knowledge, FDC-SP is the first FDC-restricted gene product that binds to activated but not resting B cells. Identification of the specific FDC-SP receptor will clearly be essential for full understanding of the distribution and function of FDC-SP binding. Production of recombinant, bioactive PDC-SP protein and Ab reagents for detecting and blocking the activity of secreted FDC-SP will be key for dissecting the potential functions of FDC-SP in regulating immunity. In addition, our identification of the murine homolog of FDC-SP will facilitate definitive in vivo analyses of FDC-SP function in immune responses. In summary, we report the identification of a novel secreted mediator that displays a restricted expression pattern, is specifically expressed at sites of ongoing immune responses by FDC and activated leukocytes, and can bind to the surface of activated B cells. We thank Geraldine Shu and Dario Magaletti for technical assistance and Ted Yun for advice on preparing site-directing mutants. We also thank Cathy Allen for help with flow cytometry, Kelly Hudkins and Charlie Alpers for help with tissue sectioning and advice on in situ hybridization, Andrew Farr for assistance with imaging of histological specimens, and Dr. Y. Choi for providing the HK cells. ↵1 This work is supported by National Institutes of Health Grant AI44257 (to E.A.C.) and a Manitoba Health Research Council Operating Grant (to A.J.M.). A.J.M. is supported by a Canadian Institutes of Health Research New Investigator award. K.T.H. holds a Canada Research Chair in Immune Regulation. 3 Abbreviations used in this paper: FDC, follicular dendritic cell; FDC-SP, FDC secreted protein; GC, germinal center; EST, expressed sequence tag; SAC, Staphylococcus aureus Cowan; SSH, suppression subtractive hybridization; BLC, B lymphocyte chemoattractant. Ryan, E. J., A. J. Marshall, D. M. Magaletti, H. E. Floyd, K. E. Draves, N. E. Olson, and E. A. Clark. D cell-asssociatedmolecule 1, a novel C-type lectin-like molecule enhances T cell secretion of IL-4. J. Immunol. In press.